← The Houstons, Alf and Myrna Have a Wedding Anniversary To-day!! A Lifetime of Memories. Ian’s Lanz Bulldog Tractor Makes My Field Marshall Tractor look like it may be from the 22nd Century!! 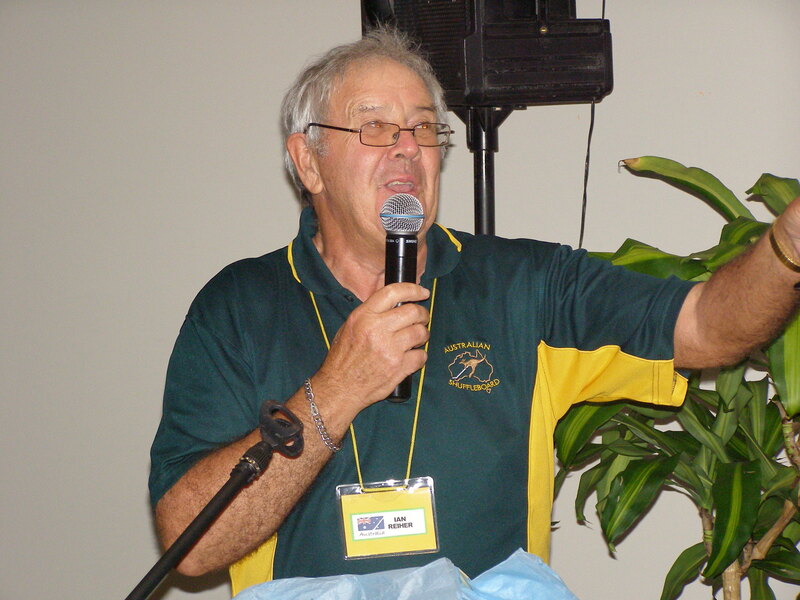 Ian Reiher, Australian Shuffleboard President Speaks: Hi Stan, Your story of the old Field Marshall tractor and its starting mechanism reminded me of my early introduction to tractors. During the summer (Australia – December, January and February) school holidays of 1949 to 1951 I drove a tractor for relatives who were share farming part of a large Western District property at Winchelsea in Victoria. They were growing barley, linseed, dun peas and oats. In remembering those Winchelsea days I will never forget the summer of 1950. Australia at that stage was plagued with rabbits and the Government in 1950 authorised the introduction of myxomatosis into the rabbit population, it is said that the rabbit population fell from 600 million to 100million during this period. Dead and dying rabbits were everywhere. The whole area smelt of dead rabbits, it was a horrible disease the rabbits died a lingering death with swelled heads and blind eyes. In the morning when the tractor had been left overnight in the paddock there would be up to twenty or so blind rabbits huddled around the wheels. We would start up the tractor and move off squashing the rabbits and putting them out of their misery. Unfortunately those rabbits which survived myxomatosis had a built in resistance to the virus and doing what rabbits do again built up in numbers and since then various measures have been taken to control them. Up to 1950 most Australian families regularly ate rabbits, a baked rabbit or a rabbit stew was a delicious meal. An Uncle of mine used to say that except for rabbits most of the farmers in the Seymour area where he lived would have died of starvation during the 1930’s depression followed by drought and then the 2nd WW. I should add that I have never eaten rabbit since 1950. Regards. Ian (Reiher) 2018 09 29 Stan Speaks: Ian; What a wonderful story! What a “wonderful Tractor.” I have never in my life read about or seen such a vehicle????? As for the Rabbits, OMG!!! Did you, our READERS, read para 3 carefully?? It is almost unbelievable from my limited background of tractors during that period???? Hats off to you Ian for getting it started!! This entry was posted in Archival Item, GENERAL. Bookmark the permalink. 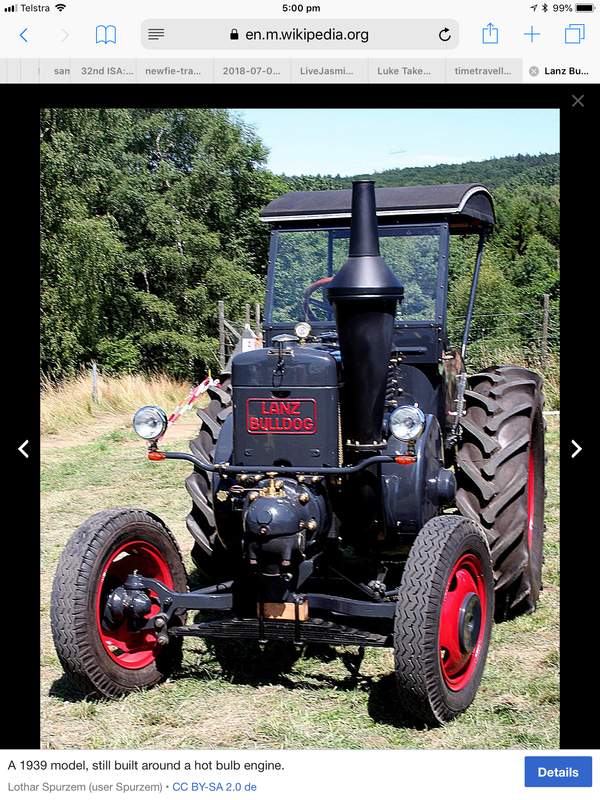 3 Responses to Ian’s Lanz Bulldog Tractor Makes My Field Marshall Tractor look like it may be from the 22nd Century!! Great story . Is that your tractor in the photo? Did that old tractor have steel wheels or did it always have rubber. No it is a photo taken from google. I didn’t have a photo of the actual one. The one involved which was owned by an uncle-in-law Perc Dowsley didn’t have the windscreen and roof. If you go to google and type in ‘starting a Lanz Bulldog tractor’ there is a good video .It is actually not too hard just time consuming but certainly better than looking after a team of horses. You had to be very careful in removing the spinning steering wheel after the engine started. The one really dangerous incident that happened when I was driving it was one day a rear wheel collapsed into a rabbit warren and the tractor started to climb up the gears and was starting to turn over backwards. Perc jumped off the header and slammed the fuel lever down and the tractor fell to the ground. I was 13 at the time. The tractor always had rubber tyres like in the picture.